Now that the Octagon’s return to FOX is officially a thing of the past, it’s time to start hyping Saturday’s “UFC 143: Diaz vs. Condit” extravaganza. To help generate hoopla for the pay-per-view broadcast, the organization has released a nine minute and 38 second extended video preview featuring some of the card’s superstars. 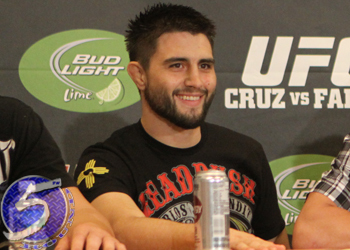 An interim welterweight title bout between Nick Diaz and Carlos Condit (Pictured) headlines the festivities. Heavyweights Roy Nelson and Fabricio Werdum will serve as the night’s co-main event. However, the 265-pounders weren’t showcased in the video. The clip features the welterweight shootout with Josh Koscheck and Mike Pierce. The event takes place inside Mandalay Bay Events Center in Las Vegas, Nevada.